The national championships in 2012 were a bit of a strange one for me, but one in which I had quite a lot of fun. 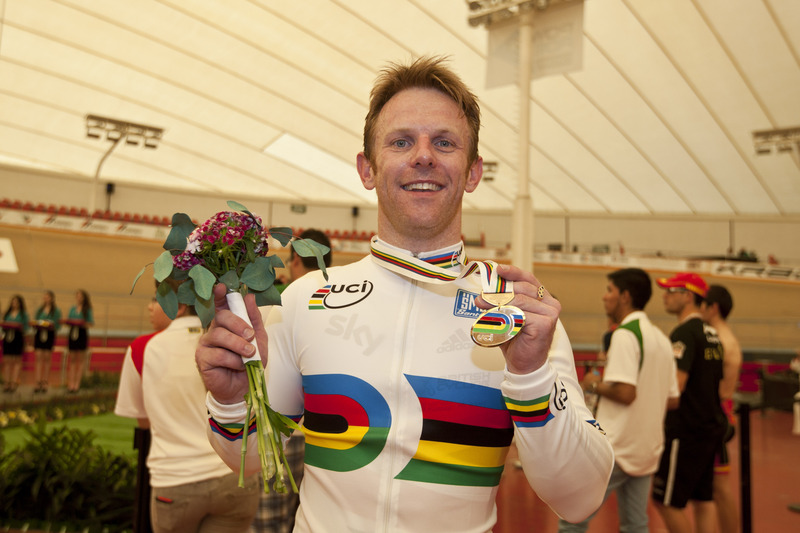 Having last raced my bike at the Paralympics, where I won bronze in the 4km pursuit on September 1st, I’d only been on my bike a handful of times by the time the Nationals came round. First up was the 1km Time Trial, my main event. With only a few training sessions under my belt I knew it was going to be a tough race, however I still wanted to perform well. I actually chose to experiment with a few things looking to the future. Once the race got underway it was clear this was going to be one of the longest kilos I’d ridden! As I came into the final lap I was just struggling to keep the pedals turning as the lactic acid kicked in. I crossed the line in 1:06.756, not my best time by a long way. After the emotional rollercoaster that was the 1km in the Paralympics to be honest it was just nice to finish the kilo! Although the time wasn’t great it helped close the door on the kilometre this year, and now I can look ahead and prepare for Rio. Ah the Keirin, a race I’ve only competing in a number of times, but one I enjoy because unlike the Paralympics I get to race multiple riders on track at the same time, and get my teeth stuck into racing! The 1st round draw was probably the toughest of the 3 heats and also had 7 riders compared to the previous heats which had 5 and 6. Things were going well as I was sat nicely on Pete Mitchell’s wheel as he started to make his move, then as I came round the outside on of the riders twitched in turn 2 on the last lap, almost chopping my nose off. I took avoiding action, but by the time I got back online the field had too big a gap, so I sat up saving energy for the repecharge. In the repecharge, I rode a strong race, although it was only good enough to take 4th place so that was my Keirin over, or so I thought. In front of me during the race the same rider from the previous heat had twitched in exactly the same place as he twitched in the first heat, this time he was relegated for the move which then promoted me to 3rd, and in turn qualified me for the Semi Finals. In the Semi Finals, I made a strike for home early, actually too early considering the quality of field I was racing. The attack worked well until the final bend where the field swamped me up and I faded in the home straight. One more race to go in the minor final for 7th-12th place I found myself on Pete Mitchells wheel again as he worked his way to the front, once again a twitch from another rider forced me to change my path, but this time I was still with the group, in the last bend I managed to dive under the fading riders in front of me, and came across the line in 4th place, which gave me a 10th place finish overall. Following on from the previous days Keirin, I was looking forward to racing in the sprint, especially as my form had got better during the day, as my racing cobwebs got blown away! Qualifying first, and something I was looking forward to, especially considering some of the times I’d done in training prior to the Paralympics. Alas that kind of form wasn’t with me, not helped by my error of judgement in gearing (I went too big!) I crossed the line in 10.972, a little disappointing, but hopefully I could put in some good sprinting during the head to heads. I qualified in 12th, but with Kian Emadi pulling out due to illness I was promoted to 11th and would be racing the 2nd fastest qualifier Lewis Oliva, in the 1st round knockout. I had a plan to use my jump and fact I was on a smaller gear to overhaul Lewis, however as we rode round I made a massive tactical error and basically raised the pace, all the time playing into Lewis’s favour. As we came into the final straight I just didn’t have enough and Lewis took a relatively easy win. Into the repecharge for me once again, the repecharge was a 3up match, which are always tough to judge as you’re not just watching 1 rider to make the move. With my 2 competitiors busy watching each other I spotted a perfect opportunity to move however it was going to be a big effort as it was almost 2laps out. I dropped in from the top of the track and down to the black line and just went full gas. I got quite a lead and felt like it was the winning move, but as I came into the final banking my legs tired from the previous 2 days racing began to tie up, and Bruce Croall came over the top to take the victory. I finished just after him, putting me out of the competition, as it was only the winner to go through. I thought this was the end of my nationals, but late that evening I got a call up to come back the following morning to do the team sprint in place of the still ill Kian Emadi. I jumped at the chance. The day of the team sprint was always going to be a tough day of competition, not least because of the previous 3 days of racing, and I was going to be teamed with Matt Crampton and Craig MacLean, riders with a lot of team sprint experience at the very highest levels, on top of this I was going to be riding man 3. Just getting on the wheel was going to be a challenge! Having never done any starts alongside the likes of Craig and Matt I didn’t know what to expect as on paper they’re nearly 1second quicker over a standing lap! So when we got called for a false start in the first round, I was understandable nervous as we lined up on the track again. Matt was man 1 and Craig 2, as the start sounded I tried to use the downhill of the track as much as possible as I rode in formation. However coming out of turn 2 they’re acceleration was nothing like I’ve experienced before and I could sense them getting away, this was going to be a long 3 laps! As Matt peeled off for the first lap I felt I was getting onto Craig down the back straight, but I simply wasn’t he was just out there, as Craig finished his lap I tried to keep the speed up, but I just felt like I was getting slower and slower! I crossed the line in 46.300, enough to qualify us 3rd fastest. Looking back at the race I knew I needed to go on a bigger gear to give me a chance of getting on, but I knew this meant also having to work even harder on the start because of the bigger gear. With a little advice from Jan van Ejiden, I was set for the 2nd round. This time Craig was in man 1 and Matt in 2, I made a much better start this time, working hard to get onto the wheel of Matt, but once again they’re acceleration in turn 2 was huge, but this time the gap wasn’t as big, and as Craig finished his lap I was chasing Matt hard, and coming onto the back straight I finally got onto the wheel of Matt. What a relief, and how much difference that made, I now had half a lap to get a breather before I’d be on my own again. I finished my lap in much better condition and the time was a massive improvement as we clocked 45.899, the fastest team sprint I’d been involved in by a long way! Once again it was good enough for 3rd position, and we’d be in the Bronze medal ride off again VC St. Raphael. In the final the previous days racing and the 2 very hard man 3’s took there toll on me. Once again Craig and Matt gapped me on the back straight of the 1st lap, and I never got on again, but I kept going flat out in the hope of getting some slipstream. I crossed the line in 46.566 which was still good enough for bronze, but I was completely spent. It was a fantastic experience racing with Matt and Craig, and has certainly given me a few things to work on when I get back to training. But pretty happy to win a bronze medal at the national champs.